Prepared in less than 15 minutes, it’s super easy and so delicious. It could be my new favorite dish. In a small bowl, combine all ingredients, and set aside. Lightly season salmon with salt and pepper, and gently score the skin side longways to keep salmon from curling up on the sides while cooking. In a hot pan, on medium/high heat, add oil. Place salmon, skin side down in the pan and cook until skin is browned and crispy, about 3 minutes. Add butter and baste fillets for another minute, turn fish over, and continue basting for another 2 minutes. Remove from heat. Fish should be slightly firm to the touch. Scoop some salsa onto plate. 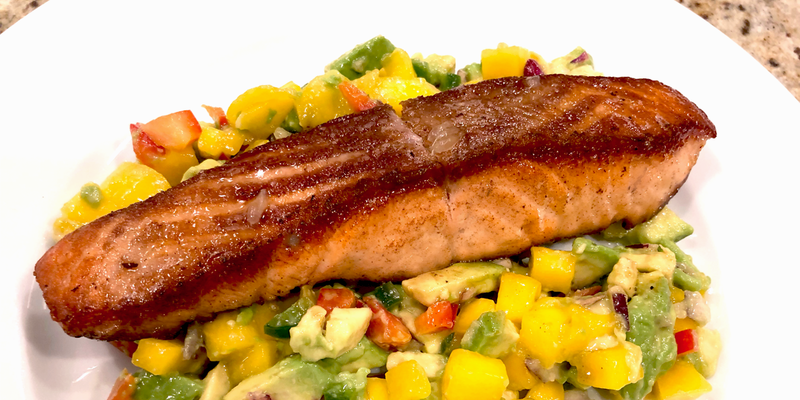 Place salmon on top of salsa (skin side up), and dig in!! Have a question or comment regarding this dish? Leave it below. I’ll get back to you shortly. I watched Evil Doctor last night. Loved you. In it. Love all these dishes ! !